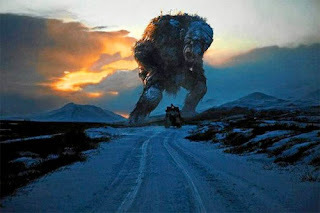 After a festival of heavy brooding dramas The Troll Hunter was a breath of fresh air, a lively adventure film using the now-entrenched found footage technique mixed with a fun b-movie creature-feature genre. Playing in the Midnight Section, it wasn’t a premiere for The Troll Hunter as it played to excited audiences at Fantastic Fest, but with the elevated playing field of Park City which meant more traditional journalists and international buyers watching the film, it was a signficant inclusion in the Festival. We catch up with the story following two film students on the tail of a alleged bear poacher who may or may not be hunting bears illegally around the rural Norwegian hinterland. The kids are both adventurous and naïve in their attempts to interview the mysterious hunter. Sensing the kids’ enthusiasm and the fact they have a camcorder available to document the trip, the Hunter brings them along. After the first encounter they’re soon to learn the Hunter is not hunting bears but trolls, giant trolls. We learn that trolls are not uncommon, in fact, they’ve been rounded up and placed in special quarantined forests for years by the Norwegian government, but with four trolls on the loose outside their designated area the Troll Hunter has been sent to capture or kill them. With the delicious governmental conspiracy in place Øvredal executes a fun filled monster-movie highlighted by some fantastic old school special effects. Although Ray Harryhausen is the inspiration the effects are invisible and seamlessly incorporated into the verite found footage imagery. And Øvredal admirably learns from the mistakes some of these other found footage films by keeping the camera level and steady for most of the time, thus losing the ugly nauseating shakiness. That said, there are subtitles to read as well so I highly recommend sitting way in the back. Written as a classic b-movie anti-hero, the Hunter is placed in the Snake Plisskin/Indiana Jones mold, a soft spoken, big stick carrying fighter who does his tasks with workmanlike efficiency. The seriousness of his demeanour, and ho-um attitude to the fact that he’s fighting living breathing trolls. contributes greatly to deadpan ironic humour. This peculiar Scandinavian sense of humour, the incorporation of Norwegian mythology, and even a little bit of black metal heard in the end credits make this a uniquely Norwegian action/horror film.